플루티스트 한영경은 계원예술고등학교를 거쳐 국민대학교 예술대학 음악과를 졸업한 후 미국으로 건너가 신시내티 음악대학에서 ‘CCM University Graduate Scholarship’을 수혜 받으며 석사과정과 박사과정을 마쳤다. 일찍이 미국 National Flute Association Masterclass Performers Competition 우승, American Protégé International Flute Competition 1위 등으로 음악적 재능을 인정받았다. 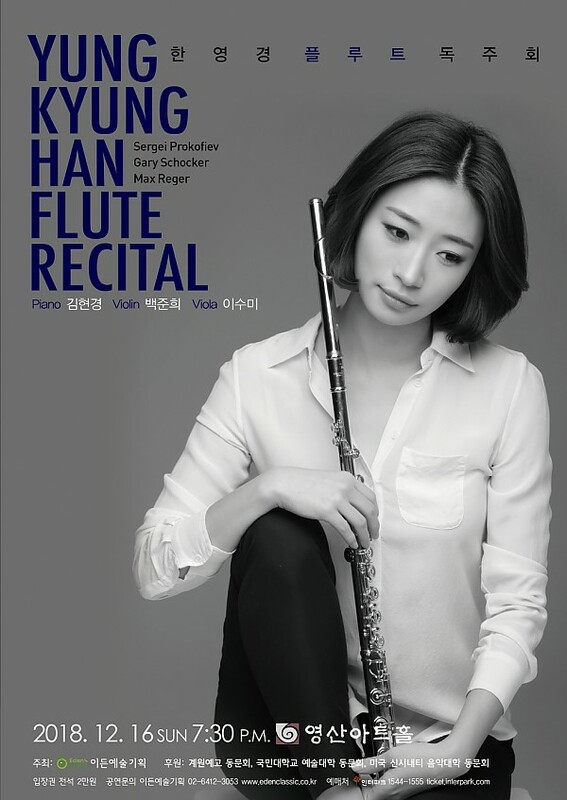 Susan Milan Flute Festival(영국), Nice International Flute Festival(프랑스), Cincinnati Flute Symposium(미국), National Flute Convention(미국)에 참가하여 Marina Piccinini, Vincent Lucas, Susan Milan 그리고 Randolph Bowman과의 마스터클래스와 연주로 그녀의 플루트연주에 대한 열정과 학구열을 채워갔다. New York Carnegie Hall에서의 입상연주와 Watson Hall, Werner Hall, Mary Emery Hall 등 다수의 독주회 및 실내악 연주, Patricia Corbett Theater, Cohen Family Studio Theater 그리고 Corbett Auditorium에서 오케스트라와 윈드앙상블 연주를 통해 다양한 영역에서 뛰어난 기량으로 폭넓은 연주활동을 전개하였다. 한편, Music X: A Festival of New Music(미국)에 플루트연주자로 참가하여 신예 작곡가들과 소통하며 현대음악을 깊이 이해 할 수 있는 기회를 얻었다. 그녀의 현대음악에 관한 관심은 미국 작곡가인 Shulamit Ran(시카고대학교 음악대학 교수)의 음악의 탐구로 이어졌고, 그 탐구는 신시내티 대학교에서 “Middle Eastern Style Characteristics in Shulamit Ran’s Flute Music”란 주제로 강의 리사이틀을 하게 하였다. 한영경은 그 강의를 발전시켜 박사학위논문 “슐라밋란의 플루트작품에 나타난 중동 음악영향”(Middle-Eastern Style Influences in Shulamit Ran’s Flute Compositions)이라는 결실을 맺었다. 2015년 금호아트홀에서 귀국 독주회를 시작으로 그녀는 활발히 국내 음악활동을 시작했으며 현재 강원대학교에 출강하며 후학양성에도 힘쓰고 있다. 귀국 후 4번째 무대를 맞이하는 그녀는 끊임없는 열정으로 자신만의 음악세계를 만들어 가고 있으며, 앞으로 어떠한 행보를 걸을지 기대되는 연주자이다.